Venezuela: A death spiral for President Maduro’s government? The collapse of the economy catalyzed by the huge drop in oil prices—Venezuela’s sole revenue producer—as well as severe state mismanagement of economic resources combined with economic-political sabotage carried out by the neoliberal political class, has led the country into an ever-deepening crisis. Electricity shortages—government offices cut to part-time, schools closed one day a week to save on electricity—severe lack of water (some communities receiving water shipments only one day a week), runaway inflation, and now devastating food shortages leading to outright hunger, are the everyday reality. Thousands march during a protest on June 1, 2016, in Bogota, Colombia, joining the farmers nationwide strike. Photo from psm-international. Food riots and the ransacking of stores are taking place, perhaps orchestrated in part by the right-wing opposition who have collected millions of signatures for a referendum to remove President Nicolas Maduro. Of course the Right and the U.S. are intent on bringing down the Hugo Chavez legacy and Maduro reality. But what is, at the same time, the responsibility of a deeply contradictory vision and practice of “21st Century Socialism” for this present moment in Venezuela? After more than three years, the peace talks between the government and FARC (Fuerzas Armadas Revolucionarias de Colombia, Revolutionary Armed Forces of Columbia) have reached an agreement for a cease-fire, and for FARC to lay down their arms. Negotiations for a final peace deal will be continuing. However huge problems remain. Among the difficulties is the perverse agricultural question. It is not possible to understand the Colombian conflict if the problem of land—the source of life, work, food and livelihood for large segments of the population—is not grasped. A huge agricultural work stoppage took place in May involving tens of thousands of agricultural workers. 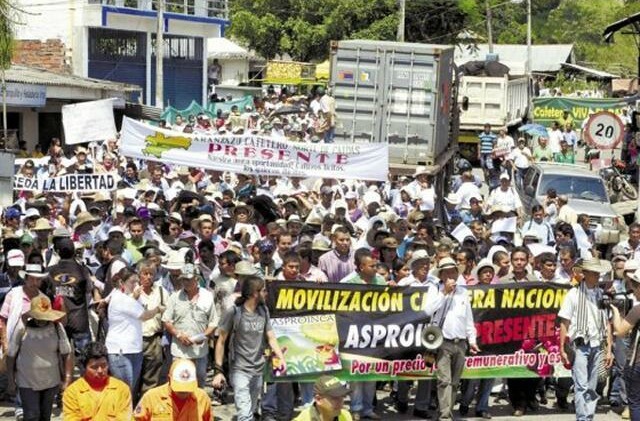 Among those participating was the Movimiento Dignidad Agropecuaria (Agricultural Dignity Movement), which brings together small and middle-sized producers from different regions of the country. What they and others face is a huge inequality in land distribution. Taking advantage of the particular circumstances of the war, ranchers, farmers and certain agricultural businessmen have concentrated land ownership in their hands. This has come about by forced, often violent, expulsion of thousands from the land. There is as well the continuing increase of food imports causing hardship to domestic small producers. The development of the capitalist agricultural system has been running full speed ahead. Meanwhile, for vast numbers of rural residents there has been increasing poverty. Peace without agricultural justice, indeed without an agricultural transformation from below, has severe limitations. In a razor-thin presidential victory, the right-wing neoliberal Pedro Pablo Kuczynski defeated Keiko Fujimori, the daughter of jailed ex-president Alberto Fujimori who ruled Peru with an iron fist, human rights abuses and much corruption in the 1990s. While the defeat of Keiko is welcomed, the choice for Peruvians was the lesser of two evils, as both candidates espouse neoliberal big business economic policies. Furthermore, the election does not mean the defeat of Fujimorismo since in Congress her party, Fuerza Popular (Popular Force), will have 73 of 130 seats. Still, it was large popular mobilizations, including the backing of the left-wing presidential candidate Veronika Mendoza of the Frente Amplio (Broad Front), who came in third in the first round of the election, that finally turned the tide. “To stop the advance of Fujimorismo, the only option is to vote for Kuczynski,” Mendoza had announced just days before the election. This entry was posted in Articles and tagged Agricultural Dignity Movement, Alberto Fujimori, Broad Front, Colombia, electricity shortages, FARC, farmers, food riots, Frente Amplio, Fuerza Popular, Fuerzas Armadas Revolucionarias de Colombia, Hugo Chavez, hunger, inflation, Keiko Fujimori, land distribution, Latin America, Movimiento Dignidad Agropecuaria, neoliberalism, Nicolas Maduro, oil prices, peace talks, Pedro Pablo Kuczynski, Peru, Popular Force, ranchers, Revolutionary Armed Forces of Colombia, Socialism, Venezuela, Veronika Mendoza, water supply. Bookmark the permalink.